I like your mount, simple yet functional. Thanks Enraged, I just did the mark and measure of 30mm of plastic mentioned in that link you posted while using Bart's measurements and it seems good. This makes me think I have some other setting that is potentially a problem. I just don't know what. Maybe I should start looking around Slic3r. Yeah, that mount gets the job done for now. It's real solid and I like a bit of wood in the mix. 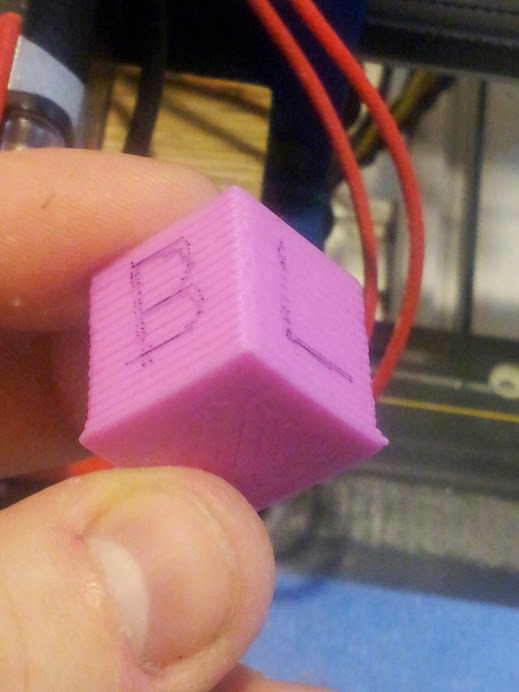 EDIT: Hmm... it probably helps to give it the right filament size... 1.75, not 3mm. I should have looked at the slic3r settings sooner. I'd like to see a nicely carved hardwood carriage. That would be the bee's knees. It looks like I'm dealing with some Z-wobble in my prints. 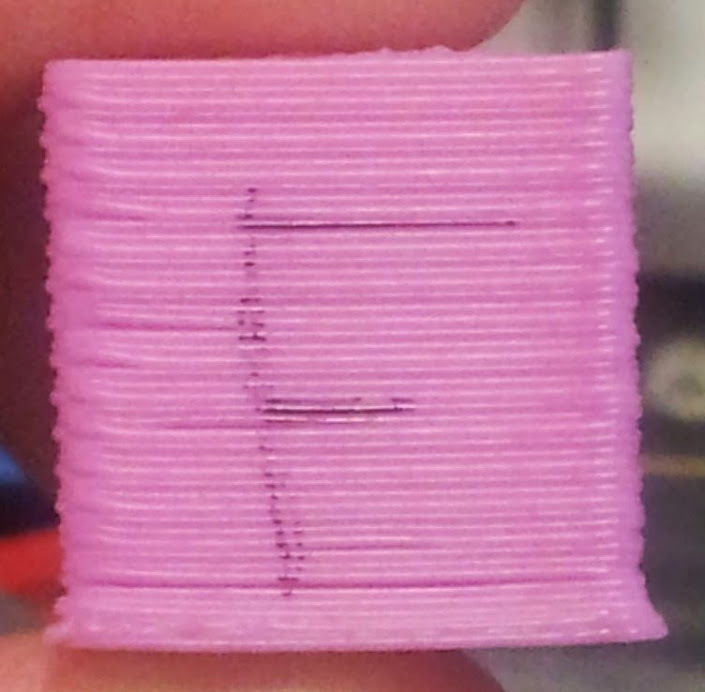 I held up the prints to the threads and it seems pretty clear that the threads correspond to the wobble. I have the ATI kit which provides the Z-wobble mod that should help remove some of that. I've adjusted the rods so they don't bounce around much, just a little. They are in a flexible coupler. I'm not sure what else to look at. 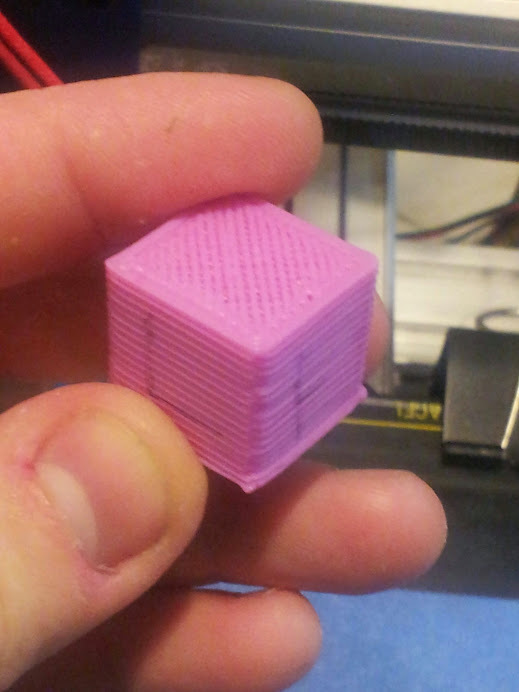 Here is a picture of my last configuration cube taken from the side. It also looks like I'm smooshing the beginning of the print against the bed too much. I figure that is just a setting in slicer to move the initial layer up a touch. I think I saw something about that and maybe also adjust the setting in slicer that controls how much plastic is extruded to a slightly higher value. Anyone have some other suggestions about where I need to tweak or what I could do to improve that Z wobble. I have a set of the Z Wobble improvements that I just took back off my machine as they didn't fix anything and actually seem to made things a little worse at times. I have a set of acme threaded rods in route to see if that helps, as one of my existing rods is bent more than I'd like. You may not be smooshing to much to as some slicers have a feature called "Brim" which will extend the first layer out to help prevent curling. Check to see that is enabled before tweaking hardware. I'd highly recommend printing and installing one of the Z adjust devices to help quick adjust 0 position. Gadroc, did you have an ATI kit that you're replacing the rods on? When I first looked at them, I thought them okay. Gadroc wrote: I'd highly recommend printing and installing one of the Z adjust devices to help quick adjust 0 position. Not sure if related, but the Hadron I recently assembled came from ATI and I had to get a replacement for one of the Z rods. The threads were damaged and would not mate to the Z nuts. flickerfly wrote: Can you point me to one? It'll allow you to precisely set your Z stop to prevent dragging the head across the bed. Oh, yeah. I was thinking I want to do that also more flexible z-stop. It just hadn't drifted up my priority list. It would be much better than the frustration of setting it now which is very time consuming. Thanks for clarifying rickmellor. Rick is correct in that's what I was referring to. Ironically I think the z wobble is better on mine after switching back to the original attached nut block.